No one will ever accuse me of being a neat freak...but I do like things organized in my own way. 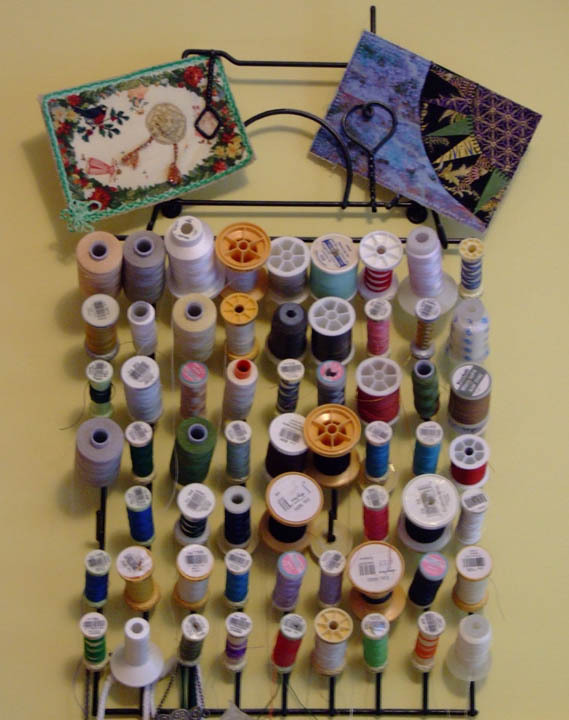 When I started quilting, my dear sister gifted me with a cute metal thread holder that hangs on the wall. It was sufficient to hold my then inventory of thread which pretty much consisted of cotton spools in basic colours: white, black, ecru, blue, red and green. As my knowledge of thread power grew and the wall holder steadily filled, sister appeared with two clear thread storage boxes...both of which I quickly crammed full. 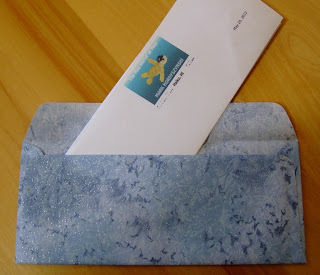 This one holds specialty threads like silk, holographic, and even some glow in the dark. Two cans house my treasured hand-quilting threads, extra-special to me as many of the spools came from my grandmother's supply. Hubby came to the rescue with a wooden board in which he hammered long skinny nails on an angle. It wasn't pretty, but worked very well for many years. 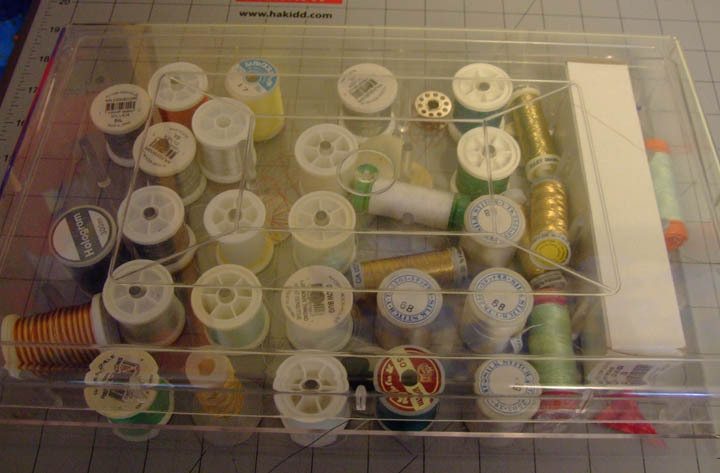 However...that thread obsession supply kept growing. He obligingly adjusted the holder down about 6" and I am happily moving into my expanded thread storage space. We'll see how long it takes to fill this one. I am keeping the smaller, original board in case it needs to go back up sometime too! 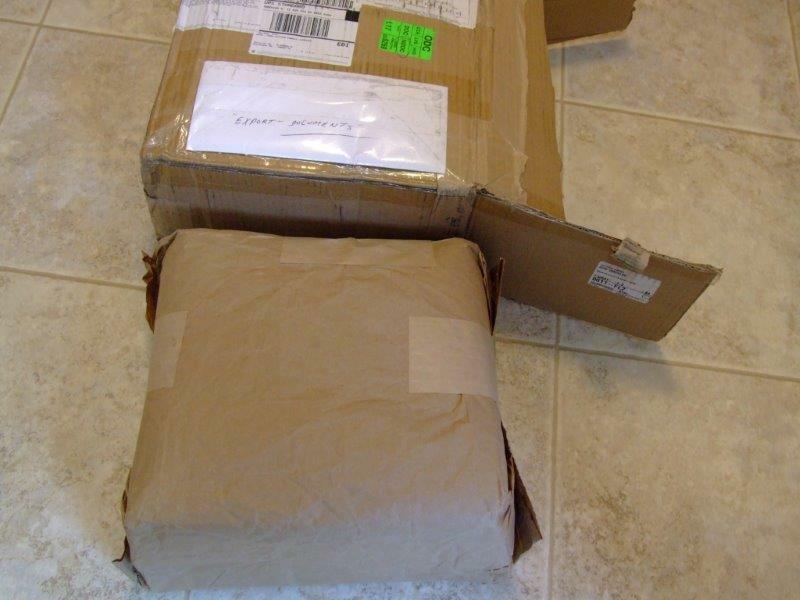 Yesterday in my inbox I received an email with a couple of pictures attached. I recognised the display name - Carol -as belonging to a friendly customer from North Yorkshire, UK. We had had several emails back and forth and I knew she was intending to enter a guild challenge with the quilt she made from one of the purchased patterns. I was prepared to see a pretty version of Roundabout Again in blue and white...and I did. A while back I bought the New York Roundabout Again pattern from you. 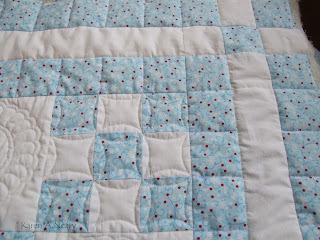 My intention being to make it using blue and white fabrics. I could then enter it in our quilt groups bi-annual show in the”Blue and White Challenge section”. Well the pattern was a challenge for me. With your help (you sent me details of fabric requirements and placements of light and dark in the pattern) I picked my fabrics. I have never completed any curved piecing before but it went like a dream with the minimum of un – picking necessary. Paper piecing makes it so easy to get good results. 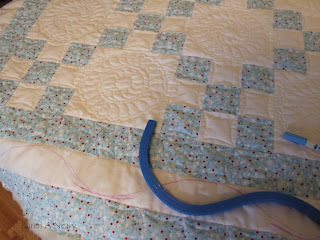 The quilting was my next obstacle. I stitched in the ditch around the blocks and then I wanted to free motion it all but had never tried the technique. 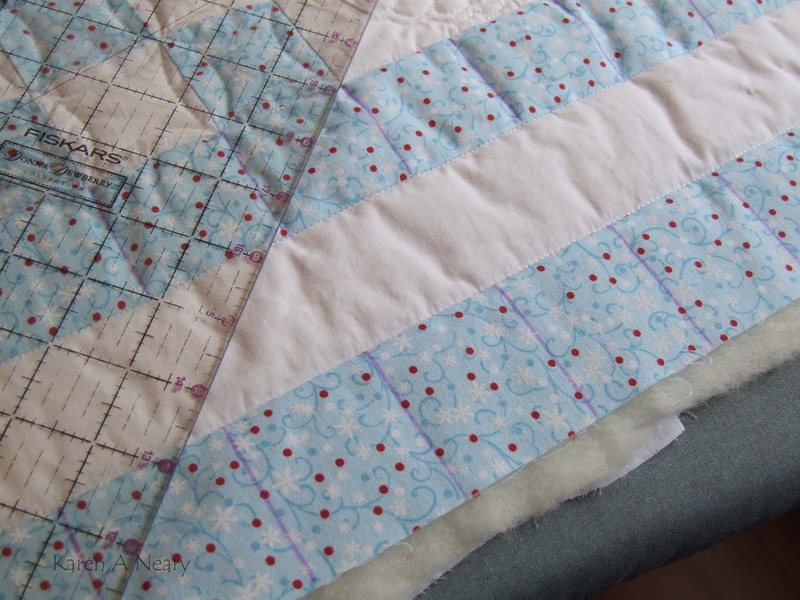 Well I made up some quilt sandwiches and started practising. I wanted feathers around the edge so that is where I started . I soon became bored practising and decided to “just go for it” I used some coins as templates to draw round to give me the curves needed on the feathers. 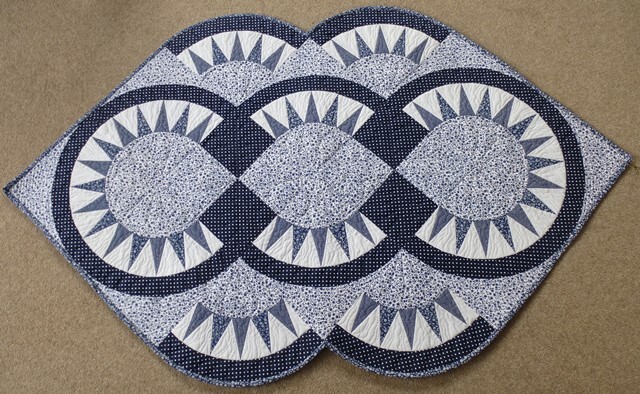 This worked really well and I carried on filling the shapes with FMQ. I even began to enjoy doing it, and am so pleased with the end result, although there is a lot of room for improvement. 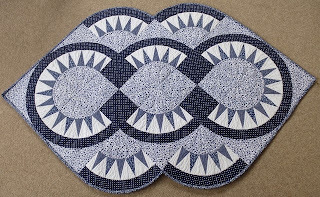 The good news though is I won the Blue and White Challenge at our quilt show. 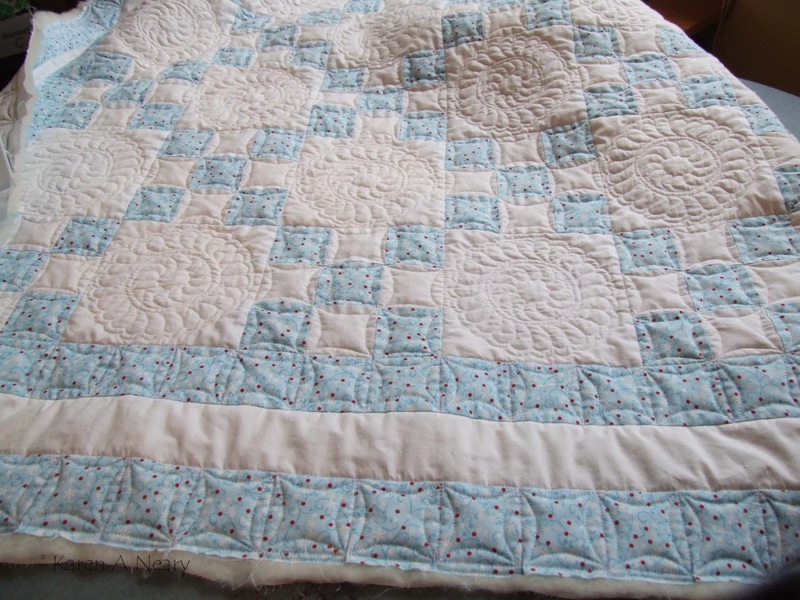 Carol's first attempt at free motion quilting, done on her first curved piecing project and she came through like a seasoned veteran - wow! 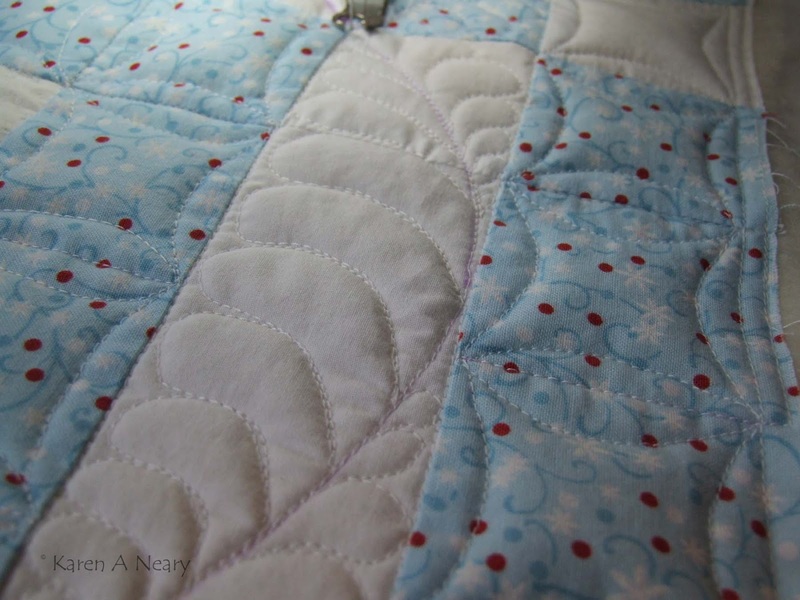 For those struggling with free motion quilting, Carol's words are great advice: just go for it. 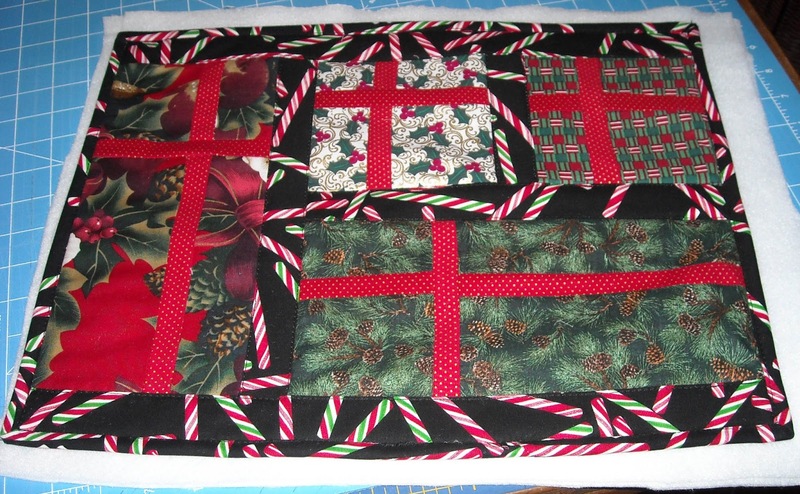 Our applause to you Carol for a job well done; can't wait to see your stitching in a year's time! Last week I spotted this post on Grandma CoCo's site and hurried to get my hand up. I figured it would get snapped up before my email reached its destination, but the timing was right. 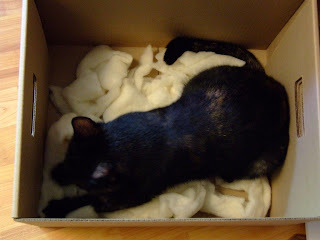 The mailman dropped this in our box this morning. The shawl is more beautiful in person than in the photograph, the merino wool is soooo soft and the work is exquisite. Tiny white beads add such a delicate touch to the edging. In my early days of knitting when I could do everything (or thought I could! :)) I used to relish the challenge of cables and fine wool...but I don't recall anything ever turning out this lovely. Now my hands are too clumsy to manipulate knitting needles so my cable days are over. I'm pretty chuffed to have this, Cheryl! Grandma CoCo offers such goodies for sale on her site from time to time to support a local humane society. Keep watching - you might be lucky enough to score next. I can show you what's in it now. Polly! She was so determined to get inside that box, so I put in a bit of wool batting scraps and let her enjoy. 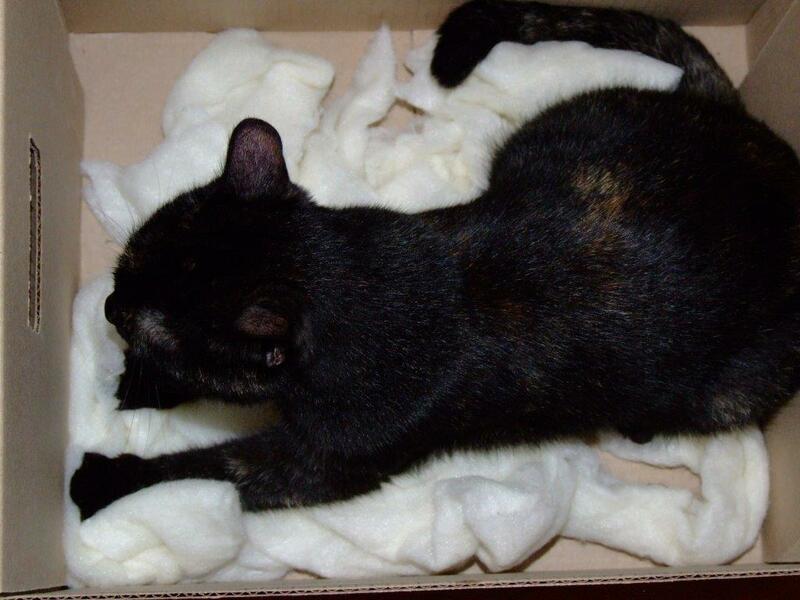 You can see her paws kneading the wool; my Gram always called this "mixing bread". Polly got as much pleasure from her favourite material as I did from mine. 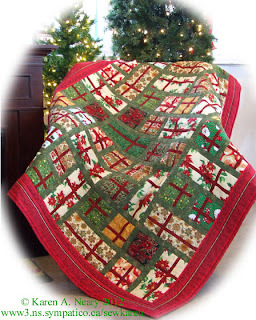 Do You Sew Christmas in July? I don't, but based on the number of "hits" this pattern has received over the past week I'd say a lot of folks do. This is Gift Scrapped For Christmas, a pattern I developed to use up my collection of little bits and pieces of Christmas prints. 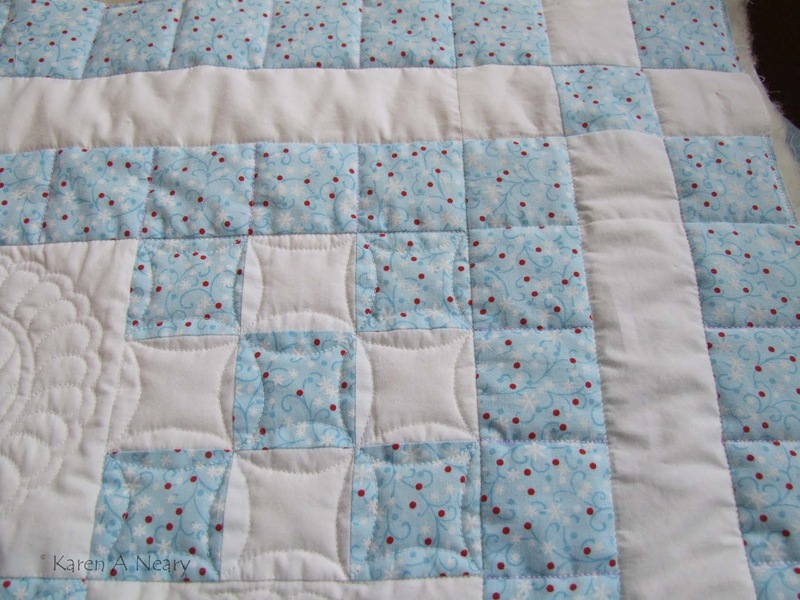 It's a great scrap-buster, and there's no cutting of small squares (just strips) and no matching of seams. Assembly goes very quickly. You could even make a mug mat. 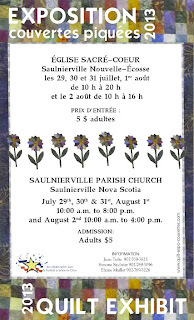 If you are travelling around Nova Scotia this summer and looking for a spectacular quilt show, you must visit the Exposition couvertes piquees 2013 in Saulnierville. I had the pleasure of attending last year and it was hands down the best show I've ever attended; the quality and quantity of the quilts exhibited is amazing. The show has it's own website, which you can visit for more information. 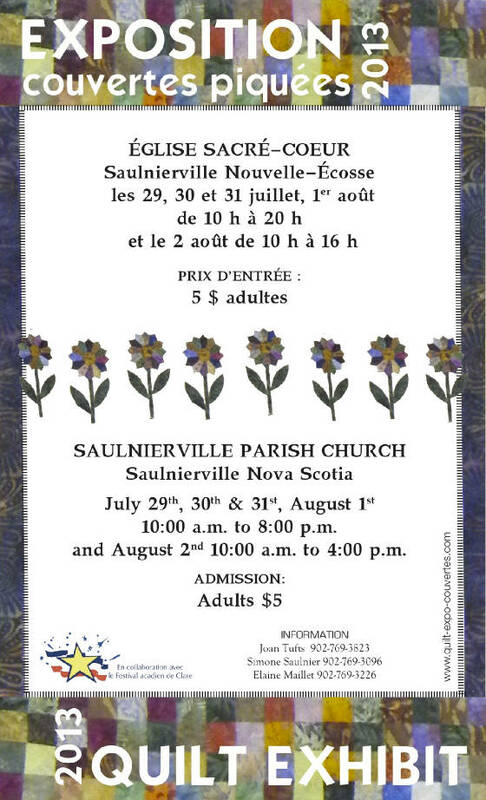 July 29 - August 1, 2013: you will not be disappointed! Wow. 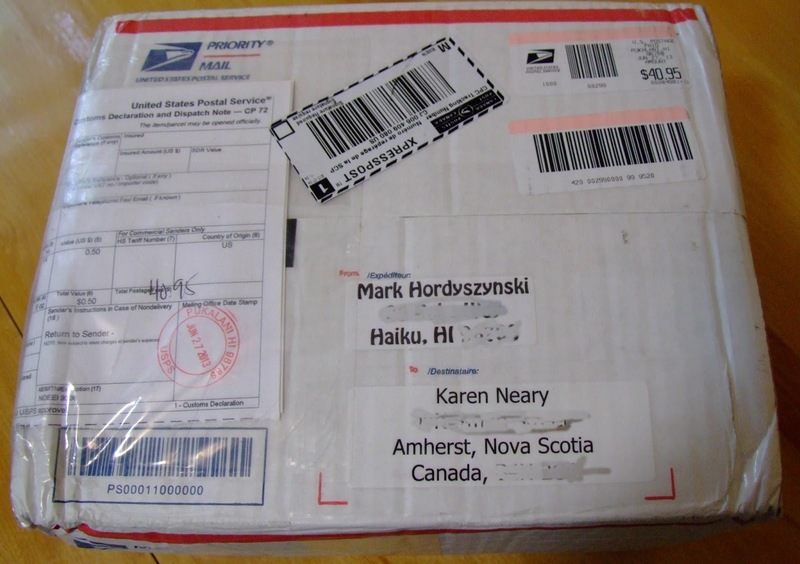 Mark Hordyszynski had hinted on his blog that he was sending a small thank you gift to each of the participants in the Mirror Ball Dot Blog Hop. The gift arrived early this morning, and it was like Christmas morning opening the box. Mark sent an amazing and fun array of items: Fusi-Boo fusible batting by Fairfield (which I've never tried before), an editor's copy of SHAG (Mark's novel - and if you check out his blog right away you can enter to win a copy for yourself), Mark's book Strip and Knit With Style, sample packs of thread from Sulky as well a book of projects using their Blendables thread, and Hawaiian macadamia nut chocolates (yum!). 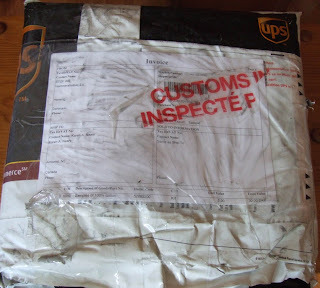 Mark had concerns that the chocolate would not travel well, but it was fine; the only casualty was this culinary sea salt which opened and spilled throughout the box. Luckily there was enough left in the package for us to sample. This adorable tiny origami shirt made by his friend Penny using Mirror Ball Dot fabric is an awesome keepsake. I love it! Mark wrote a wonderful letter, which was in this envelope made from Fairy Frost, another of his fabrics. Again, it was such a treat to be included in this blog hop. Mark you certainly made it special. Me ka `oia`i`o; Mahalo. With so many families away for the summer, I believe the dedication of the final antependium won't take place until the fall. However, it has been delivered and shown to many so I decided to blog it now just to finish up. This is the last of the 16 commissioned antependiums. I chose to go with white and gold to complement an existing table cloth used in this church for Communion. 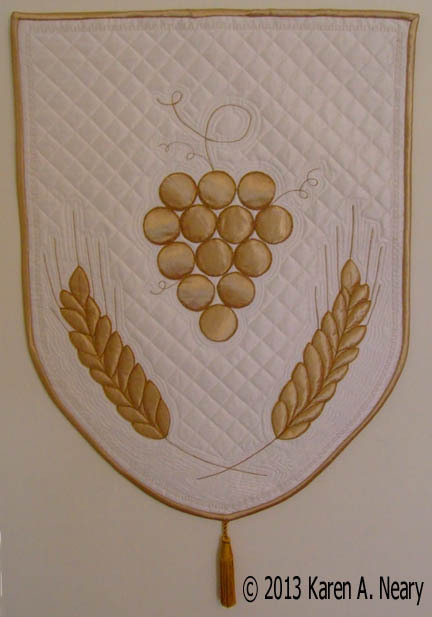 Previously, I showed you the grapes here and spoke of the quilting in this post. Here are a few "in between" parts. First, is laying out the elements of the design on the background. I just do a few rough sketches with black Sharpie on freezer paper, and place it underneath the silk. It is dark enough to show through the white silk. Embroidery with gold metallic thread is added free motion. In the beginning this looks like a big mess and you have this awful feeling that it's ruined and you (and by "you" I mean me!) will need to start over from the beginning...but eventually the details start to emerge, and you (I) can breathe again. It's amazing how the thread builds into something that looks like hand embroidery. Around and around and around and around and around and around and around the grapes...and then on to the next one. It's such fun to whip out and add a tendril here and there. A border of gold is stitched along the outside edges using my Bernina's built in decorative stitches. The elements are outline and echo quilted free motion. 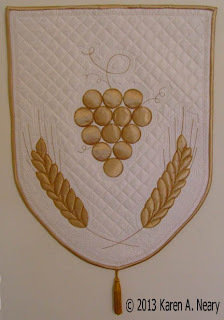 In addition to echoing the grapes and wheat, a 1" grid is quilted in the background. The worst part was hand sewing on the satin binding. I would think twice before using satin again on the outer edge. I took a quick snap when it was delivered to make sure it fit. It looks lovely in this beautiful sanctuary. 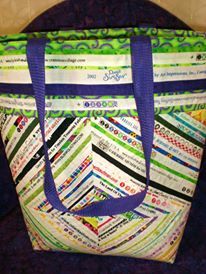 The Selvedge Tote has been one of my most popular patterns; folks are seen sporting these at lots of the big quilt shows. It's a fun design as no two ever quite look the same. 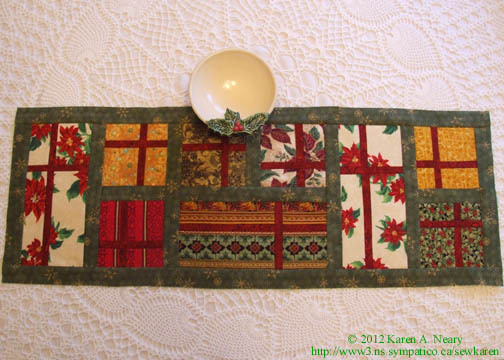 Diana Ruby from Reno has made several and is currently working on another. She sent along a picture of her last one and writes, "The photo doesn't do the colors justice. The handles were a bright vivid purple...turned out super cute!" It *is* super cute! 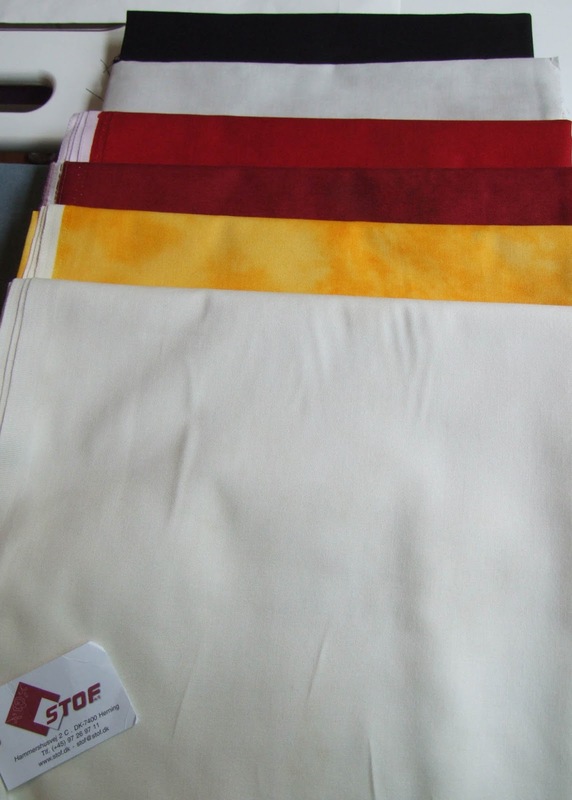 The bright colours chosen for the trim really set off those selvedges nicely. I have another selvedge bag body ready to trim and I think I will follow Diana's lead and choose vibrant, bold accents. Thank you Diana for sharing this picture; can't wait to see your next one! 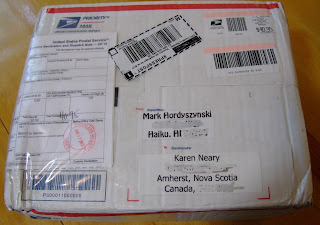 The multi-talented Mark Hordyszynski is giving away an editor's copy of his book SHAG - a very cool prize. All you have to do is leave a comment on his blog post. Good luck! When my Fixnzip arrived, the first thing I did was watch the how-to videos on their website: http://www.fixnzip.com The hardest part was deciding which zipper to fix first! I chose a favourite hoodie which -other than the worn out zipper - was not ready to be tossed. The size of the zipper is stamped on the back, and a medium Fixnzip was the right one for this job. All you do is screw it in place and zip it up - voilà! There are two pulls which come in the package so I will let my son choose which one he prefers. The best part is this is easily removed and used on another zipper when the time comes...and it will. In this house, it would be handy to have a drawer full of these at the ready. Thank you Fixnzip for the time you saved me replacing this zipper. ...and a time to every purpose under the heaven. Yesterday was my time to dance - what a day. It began with an unexpected income tax refund from an audit (never mind if it was $5.12, it was still in my favour!) Then the call from AQS; I had barely hung up the phone when the doorbell rang and there stood the UPS man with a packet for me, all the way from Denmark. 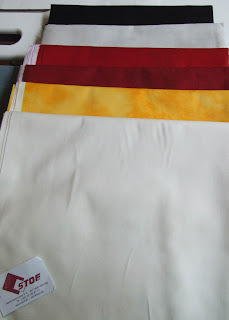 Stof Fabrics has kindly and generously sent me some of their gorgeous fabrics for use in my work. I wish you could reach through the computer monitor and feel these; similar to a Kona Cotton in weight but with a marbled colouring, they will quilt up beautifully. The timing is amazing, as I can start in right away on the projects for the book. From my study of Greek theatre in university (and no one ever thought it would serve a purpose!! ), I'd call this an example of deus ex machina. Dancing over, this is now my time to sew. It's me jumping up and down...joined by my family (including my tiny mother who jumped gingerly) and by Monika (who actually took the phone out on her deck to yell "woo hoo" so she wouldn't disturb her daughter.) We are jumping with excitement because I just got off the phone with Elaine Brelsford...book editor at AQS. (insert many, many smilies here). 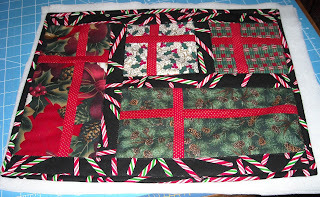 The decision got decided and the quilting got quilted. 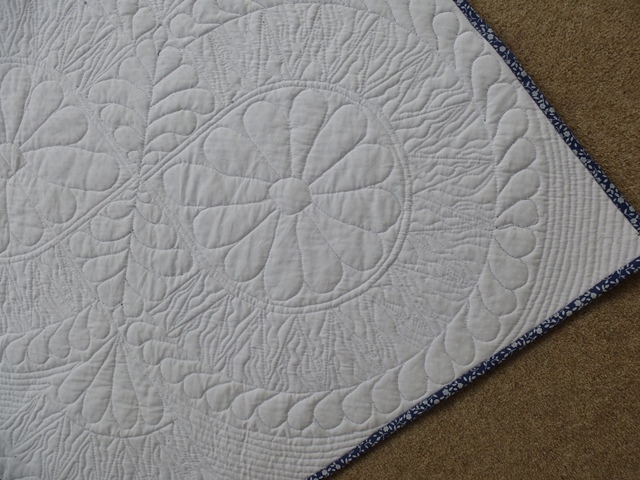 In the end, I treated each of the three stripes in the border individually and carried the quilting motifs from the centre of the quilt out into the borders. The blue stripes were sectioned off into squares using an air soluble marker to keep the lines true. Inside each square, I did the continuous curve as in the Nine Patch blocks. In the white strip, a flexible ruler was used to mark a gentle curve running from one side to the other. This was all the marking I did, and it was merely to keep things symmetrical. I find once you get the quilt under the machine needle, you loose sight of the big picture; it helps to have a line to keep you on track. Using the purple spine as a guide, feathers were free-handed up this spine around the perimeter of the quilt. This is one of the things we will be doing in the Beginning Feather Workshop during Fibre Arts Festival this October. If you are interested in joining us, please email to get your name on the list. The classes are filling quickly. I'll show you the whole quilt as soon as I get some pretty pictures taken. That won't be today however, as I am awaiting the arrival of a UPS truck delivering new fabric. Can't wait!